Vegetable pastry pinwheels-A savory snack dish made with vegetables such as peas,carrots,potatoes and sweetcorn encased in puff pastry and baked in the oven. A delicious snack served with chutney. 1 tablespoon flour for rolling out the pastry. 1. Heat the oil in a pan when hot add the mustard seeds. 2. Add the carrots, peas, sweetcorn and potatoes. 3. Add the spices, lemon juice and sugar and cook the vegetabls till tender. 4. Cool the masala. Add the coriander and stir through. 6. 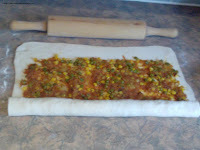 Spread the cooled masala all over the pastry leaving about 1 cm clear at top edge. 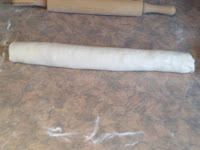 7.From the bottom edge gently start to roll the pastry,making sure it is rolled tightly. 8. Seal the edge with some water and secure by pressing the edge down. 9. Cut the pastry roll in to 5mm thick slices and place on greased baking tray. 10. 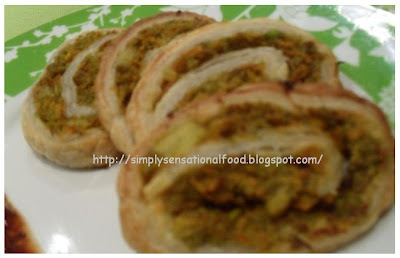 Preheat oven to 200 degrees centigrade and cook the vegetable pastry pin wheels for about 15mins until golden brown. Serve with tamarind and coriander chutney. 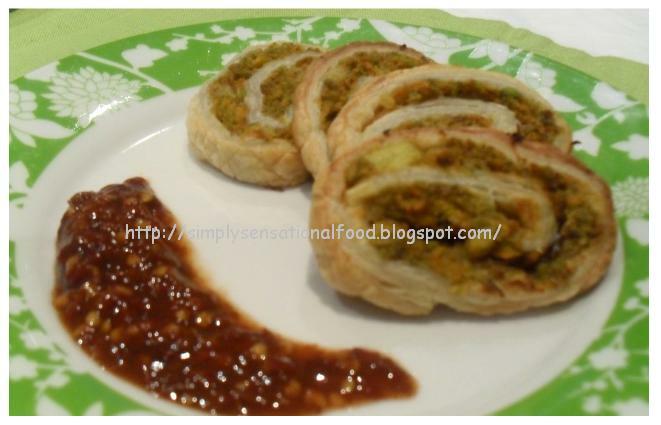 i recently made these pinwheels on my daughters bday,it turned out really well ,thanx for sharing this yummy and easy snack recipe..will soon post this recipe on my blog with ur link and my pics..thanx again.